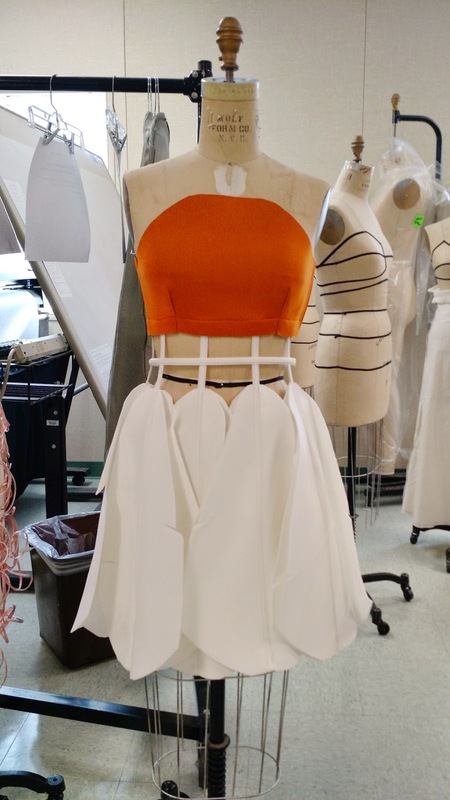 I've been taking fashion design classes at a local community college...a class a semester, whatever I can fit into my teaching schedule, nothing too strenuous. 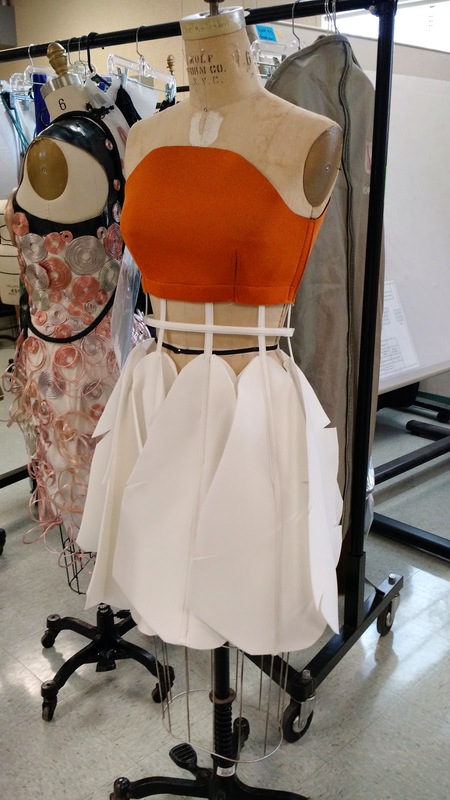 Anyhow, while sitting in my fashion illustration class a month ago, there was an announcement for a fashion design competition. Well, the college athlete in me can't resist a competition, so I entered! 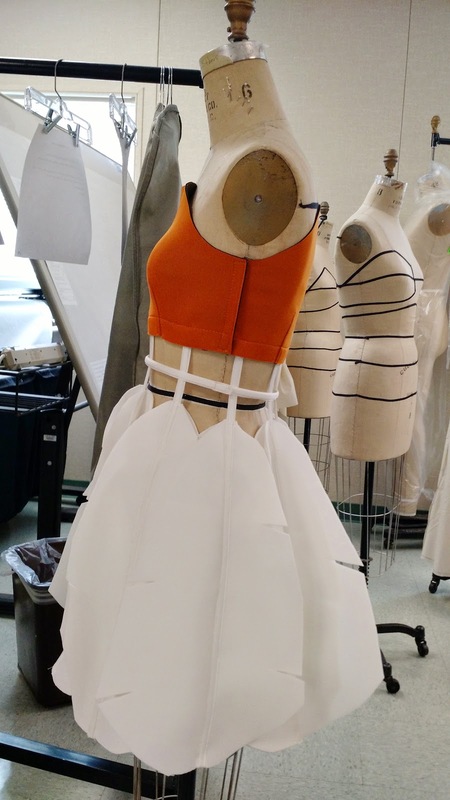 The process of designing the garment in my head took a while. 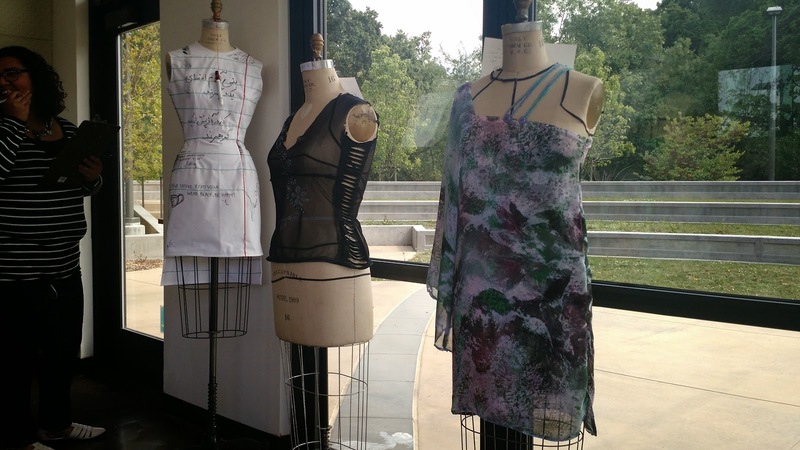 At multiple points, I was reminded quite clearly that I am actually NOT a fashion designer! I knew it had to be made out of scuba knit (purchased from Mood here and here)----the feathers would be so much easier to manage and give a nice, stiff yet flexible look--and I knew boning would have to be involved. How to put it all together? Yeah, that was the hard part. The bodice is drafted from a contouring sloper bodice (to my measurements!) and is sewn with front and back darts, with a strip of velcro on the side. The feathers involved some trial and error--in the end, each one is a double layer of scuba knit, with a strip of covered boning sewn down the length. The top layer of the feather was randomly slashed to give a more "feather-like" appearance. Each is attached to the bodice with a stay of 1" wide elastic. A circle of boning at the waist is hand stitched to each feather, with a tiny snap at the side as an opening. After trying on the dress, it was clear the feathers needed to be tacked down for modesty, so the bottom layer of each feather is tacked to its neighbor. 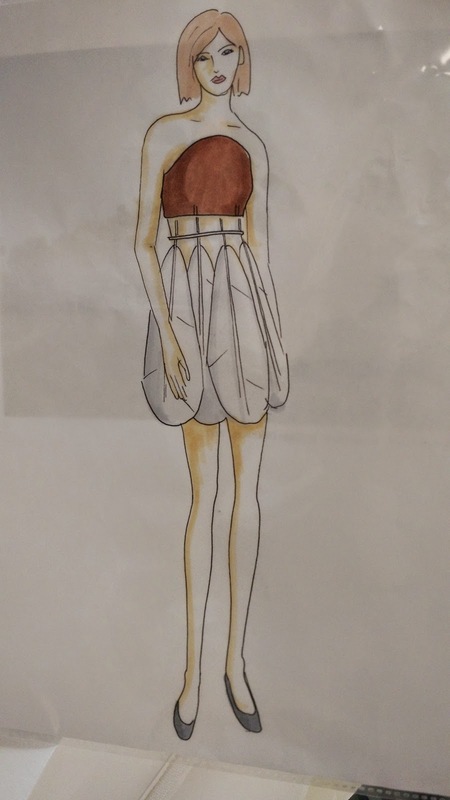 Here is my fashion illustration of my garment--I haven't finished the course yet (still a month to go), but I've learned enough to be pretty happy with my rendition! 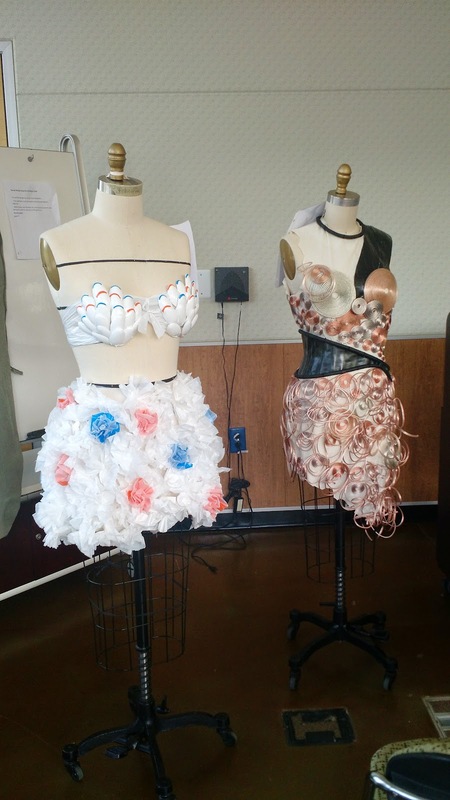 The white "paper" dress on the left (below), was winner in the "yarn as inspiration" category. The dressmaker encouraged everyone to sign or draw something on the garment. 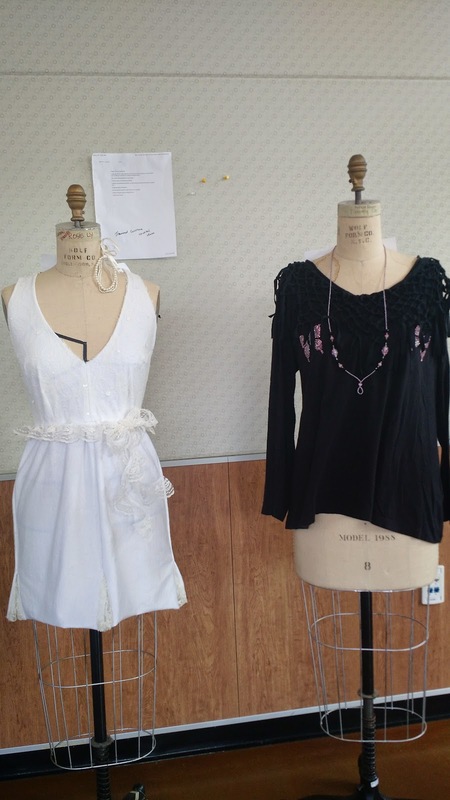 White dress on the left (below), winner in the "transform a t-shirt" category, is all lacy on the back. And mine, winner (out of 2 entrants :) in the "pop art" category! Thanks to the members of the Fashion Club for organizing the whole thing--it was truly a fun and challenging experience! Someone needs to have a costume party, and soon! 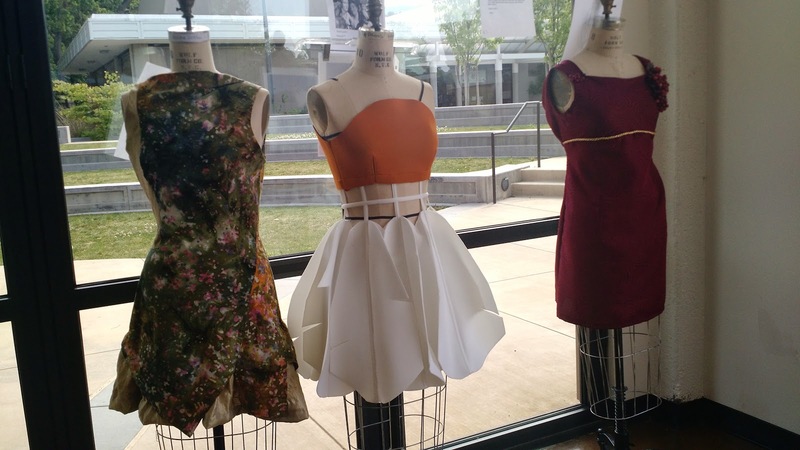 Until then, my dress will be on display in the student center at West Valley College, if you happen to be near Saratoga! How fabulous. I really love the line of the sleeveless bodice, so elegant and chic! Congrats on winning ( you should have left out it was only 2 entrants!). It's cool, hilarious and perfectly executed all at once. And we HAVE to have modelled shots please! Love the dress; now everytime I see the shuttlecocks at the Nelson-Atkins Museum, I'll think of your dress. I am incredibly jealous that you get to see them in person. I'm obsessed now! Here in the Bay Area, we have "Cupid's Span" by the same artist, but it's not the same! You are so lucky to be able to take classes at West Valley College!! They've got videos on YouTube that I've watched repeatedly. Congrats on the win! 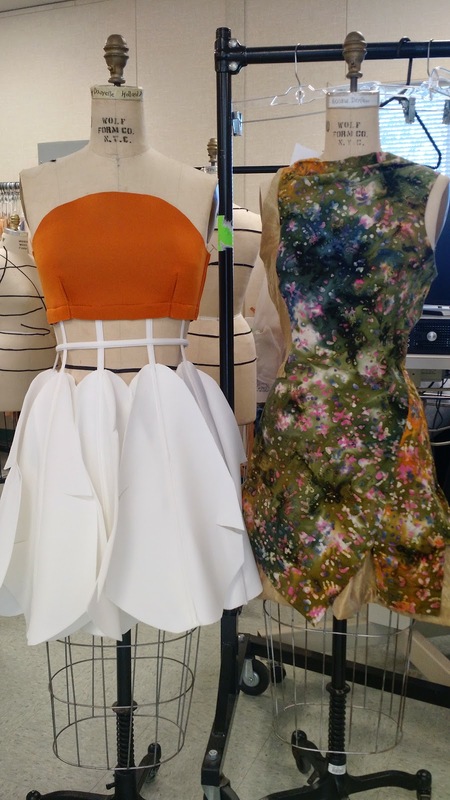 The instructor in the videos, Tiina Keller, was my instructor for both Patternmaking I and II! She's incredible (and I watched all those videos like crazy too, while I was sewing my class garments!)! wow, love it! beautiful concept and design!! Thank you! It's really literal, but that's my scientific mind at work! Love it! As soon as I saw the picture of your dress and "pop art," I immediately thought of the Nelson-Atkins shuttlecocks. My kids love looking at the shuttlecocks -- they're huge and tower over us every time we visit the museum. Great interpretation! This is great! The shuttlecocks are a 30 minute drive from my house and I laughed when I saw you chose them. Your interpretation is fantastic! I'm so jealous! They are stunning and as I mentioned above, I SO want to wear my dress while standing next to them! that is so clever, beautiful. This is an amazing dress! So creative! HAHAHAHAHHAHA! That is FABULOUS! So creative! BEAUTIFUL! I live a few blocks from the shuttlecock sculptures and I've always LOVED them. This dress would be great to wear to an arts fundraiser.